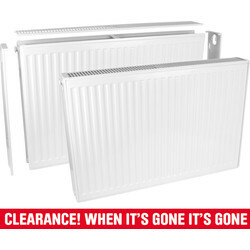 Update your central heating system with Toolstation's range of single radiators, double radiators and double single radiators, or if you're a tradesman find radiators at a competitive price that come in a wide range of sizes to fit any home. 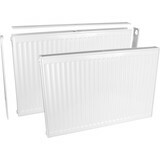 Browse our type 11, type 21 and type 22 radiators, with the first digit indicating the number of panels and the second digit indicating number of convectors. 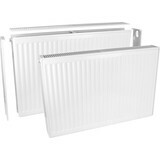 Alternatively, try our double radiator that comes as a type 22 radiator for all your central heating needs. The type 21 single radiator is fitted with top grilles and side panels, a white paint finish and radiator brackets, wall fixings and bleed plugs. For a simpler and more modern aesthetic, try our flat radiators that come with a white finish and finalise your central heating by securing any radiator with our universal radiator brackets. Toolstation orders of over £10 receive free delivery or click and collect from your nearest Toolstation store.